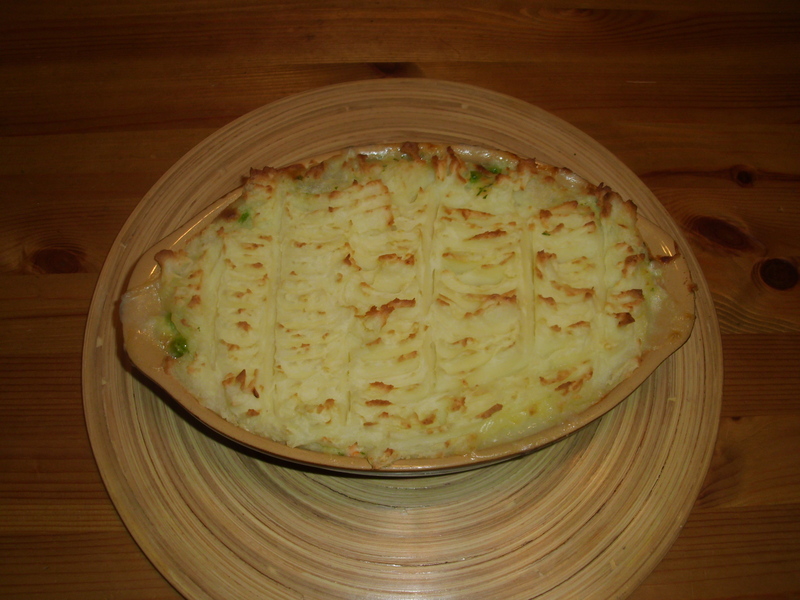 There are all sorts of fish pie and I have tried loads of recipes but I still prefer the one I have been making for years. It isn’t complicated and does not contain a lot of fat, it’s just great comfort food. I can always tell when a recipe is good as there is silence around the table when people are eating, broken with the occasional mmmm! Last night, when we had this, was just such an occasion. The best thing about this pie is you don’t need to get hung up on the contents. Last night I make it with cod, salmon and prawns. I never put boiled eggs in as some of my friends hate them and, I have to say, I struggle a bit when they are in a fish pie. Some people don’t like prawns so if I am feeding them, I simply substitute the prawns with smoked haddock. This works really well and gives the pie a great smoky flavour. I thought todays food trivia could be about cod. Cod is a really popular fish with dense white flesh and a mild flavour. The livers are processed to make cod liver oil, an excellent source of vitamins A, D and E and omega 3 fatty acids. I remember my Mum making me take cod liver oil tablets in the winter when I was a child. I hated them, firstly because I couldn’t swallow them and, secondly because they repeated on me and left a foul taste in my mouth. In the UK, cod is the main fish used in the traditional Fish and Chips, along with haddock, but due to popularity, cod is currently at risk of being over fished in the UK, Canada and most other Atlantic countries. This has caused controversy dating back to 1990, since when various committees and Government Departments have tried to restrict the fishing of cod. Thankfully, we are still able to buy it but it is now much more expensive than when I first made this fish pie. Anyway, here is the recipe. It is a meal in one so there is no need to add more vegetables when you serve it, unless you want to of course. Heat the oven to 200c/190c fan/gas 6. Put the studded onion and the milk in a pan, slowly bring to a simmer. Continue to simmer for about 15 minutes. Make sure the milk does not burn on the bottom of the pan as this will give it a bitter taste. Remove the milk from the heat, discard the onion and leave the milk to cool a little. In a separate pan, melt the butter then stir in the flour. Cook over a low heat for a minute. Slowly add the milk, stirring between each addition to prevent curdling. When all the milk has been added bring slowly to a simmer, stirring, and cook until the sauce is thick and smooth. Add the fish and prawns to the sauce and simmer for 5 minutes. Stir in the chopped parsley and the peas and continue to cook for 1 more minute. Tip the fish and sauce into the bottom of an ovenproof dish. Top the fish sauce with the mashed potato then cook in the oven for about 25 minutes or until the top is browning and the sauce is bubbling underneath. Serve, but be careful, it will be very hot! ← Paella for a friend. Excellent website. A lot of helpful info here. I am sending it to several friends ans also sharing in delicious. And naturally, thank you for your effort!